The mood was festive and the crowd abundant at the launching of the Sylvan Adams Sports Institute, held at TAU’s Elite Sports Center. 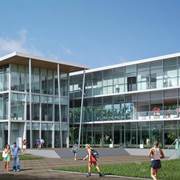 The Institute, unprecedented in Israel, will conduct novel sports research as well as promote sports testing and training with an emphasis on aerobic sports of cycling, swimming, running and triathlon. Its overriding mission will be to instill new standards of performance excellence among Israeli athletes and develop the academic field of performance enhancement in Israel. 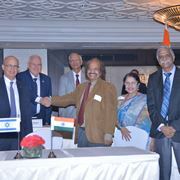 As such, it will serve as a national resource for organizations such as the Israel Olympic Committee, Paralympic Committee, the IDF, and various children’s sports frameworks. 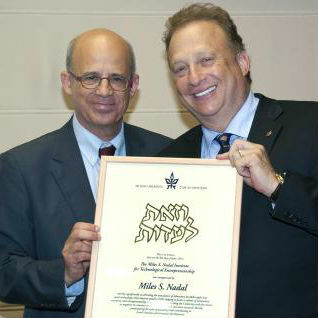 Mayor of Tel Aviv and TAU Honorary Doctor Ron Huldai gave the first address. He praised Sylvan Adams, who recently made aliyah with his wife, Margaret, for initiating several major sports projects in Israel. “These include a gymnasium in Kfar Shalem, Israel’s first Velodrome in Hadar Yosef that will be inaugurated next year, bicycle lanes in Tel Aviv and now Israel's first academic sports research center,” said Huldai. TAU President Joseph Klafter spoke of the new Institute as “the launch of a wonderful, grand vision that will take Israel to the next level of sports science and athletic excellence.” He noted that Adams is a second-generation TAU benefactor, whose father, Marcel Adams, founded the Adams Super-Center for Brain Studies at TAU and was a founding member of the Canadian Friends in Montreal. “Sylvan has translated his personal passion into social action. I believe he aims to single-handedly put Israel on the international map for competitive cycling. He won’t stop until we win top sports medals – including at the Olympics!” Prof. Klafter continued. “The idea of this institute was to enable Israel to be the startup sporting nation,” enthused Adams. “We want to show the world that we’re a ‘normal’ country that does ‘normal’ things – not just engage in wars. Israel is often poorly presented in the international media. Through sports, we can reach apolitical, unaffiliated sports fans, forge bonds of friendship and show the strength of our country to the world,” he said. Yael Arad, Israeli silver medalist at the 1992 Barcelona Olympics and Israel’s first Olympian, attended the ceremony in her capacity as a board member of the Israel Olympic Committee. She thanked Sylvan and Margaret “for their vision in creating something that can truly help build the next generation of Israeli athletes.” Other speakers included International Coordinator of the Ministry of Sport and Culture Gazi Nujidat , adviser to the International Paralympic Committee Dr. Osnat Fliz-Douer, and TAU’s own Dr. Sigal Portnoy, an electrical engineer with expertise in sports biomechanics. Concluding remarks were given by TAU’s Prof. Mickey Scheinowitz, Chair of the Department of Biomedical Engineering, Fleischman Faculty of Engineering, who will serve as Head of the Adams Institute. “The Institute will promote excellence in sports biomechanics, physiology, engineering, psychology and motivation,” said Scheinowitz, who is himself a sports enthusiast. “It will introduce teaching programs in these fields at the master’s and doctoral levels. “The Institute will also offer a "hypoxic hotel" that will be part of the Student City dormitory complex, here on campus. The rooms there will be the only ones in Israel to accommodate athletes in a low oxygen environment, which has been shown to improve athletic performance,” Scheinowitz added. The ceremony concluded with the formal signing of the Memorandum of Understanding for the Institute by Sylvan Adams and Prof. Klafter.